The Corner Antiques store opened earlier this month on the Blake Block at 88 Great Road. I spoke to Jan McGrath, the owner. Jan has always loved antiques. As a child she remembers her mother dragging her around antique stores. Jan grew up in Lexington, then moved to Texas and Florida and finally moved back to the area 10 years ago. She has been a Bedford resident for 5 years. About 10 years ago, she started doing group shots with other antique dealers in the Sterling area (about 35 miles west of Bedford). With the price of gas going up and her inventory of antiques increasing, she begin to look at other options. In September she saw a space for rent sign on the Blake Block. She thought the rent was very reasonable so she decided to open a store. This location was formerly Edward Jones. The repainting and the window etched signs give this storefront a more upscale appearance. 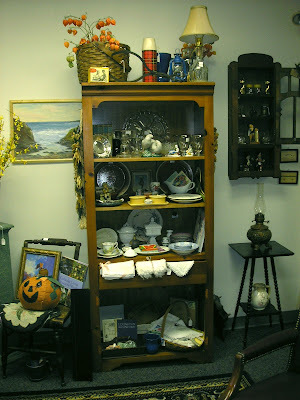 The store not only features her items but also antiques and collectibles from other dealers in the area. 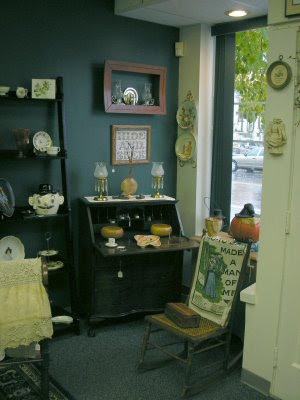 The focus of the store is affordable antiques. Most of her items are in the $20-40 range. Jan is not interested in selling items that cost thousands of dollars. The store is stocked by multiple antique dealers ensuring a steady supply of new items. According to Jan, business has been very good so far. She had advertised in several papers and been pleased with the results so far. She also notes that while there have been consignment stores in Bedford, hers is currently the only antique store. She notes that most of her customers are buying items to give as gifts. 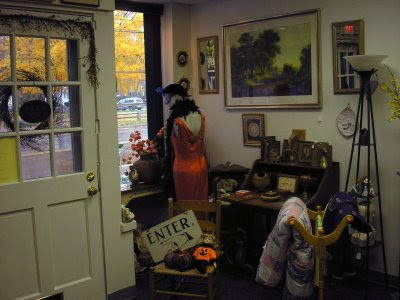 In addition to antiques, she sells a lot of collectibles and gift items, especially to younger customers. 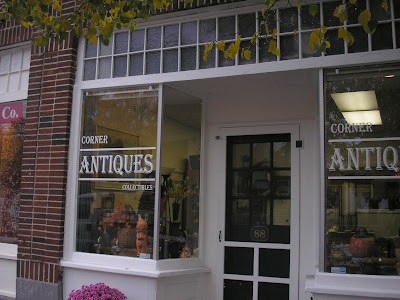 Corner Antiques features a mix of antiques, collectibles and gift items. Since her store stocks merchandise from multiple dealers, her inventory is always changing so Jan implores her customers to check back frequently for new items. She also offers a wish list service where she will let you know when a specific item is available. In addition to selling antiques and collectibles, she does accept some high quality items on a consignment basis and does estate liquidations. The store is currently open 11am-5pm from Thursday - Sunday and by appointment. She is planning to extend the hours for the holiday shopping season. The store accepts high quality items on a consignment basis. Besides her interest in antiques, Jan has spent 20 years in the direct marketing industry and currently owns a direct mail company. It's interesting to note that with the very reasonable rates that Bruce Blake has been offering, almost all of the retail space has been filled in just a few months. What's also interesting is that many of the businesses are being run by Bedford residents and the rental rates have been a major factor in getting them to open up their first retail business. Currently the leases on the Blake Block are scheduled to run through next spring when demolition for the "new" Blake Block is scheduled to begin. With the tightening credit market it's unclear if that will occur. I do think it's a positive thing that most of the block has been rented out. The new tenants have all updated their storefronts to greatly improve the appearance of the block. What a beautiful shop! Very nicely decorated with plenty of room to browse. Highly recommend! It's worth going in just to chat with Jan, she's a doll. You initially get drawn in by the outstanding window displays, they are truely a piece of Art. Then once inside, your drawn to every little niche to see all the other merchandise tucked away on a shelf,under a shelf, or hanging from the ceiling.But best of all are her prices, whatever you leave with, you know you haven't overspent for it.Check it out for youself!